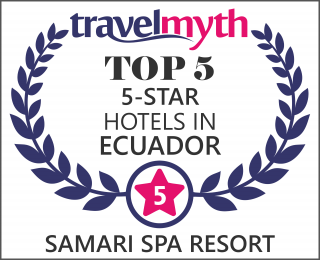 Hotel Samari Spa Resort, Jewel of Ecuador! Winner of the "Travelers' Choice ™ 2017" on TripAdvisor! Located in Baños, Ecuador, Samari Spa Resort is the result of 10 years of work, audacity and creativity, taking into account thousands of details with the aim of providing its guests with a destination of rest, adventure and unique well-being in their authentic and luxury style! Free WIFI, hotel with 37 spectacular rooms, Spa with indoor and tempered pool, convention rooms for 280 people, gourmet restaurant, indoor and outdoor bars, original tavern, variety of activities and unforgettable adventures, pleasures that will suggest you stay at Samari Spa Resort forever! In Samari Spa Resort, you can rest in splendid luxury rooms, walk and discover a unique, preserved and authentic place (we have more than 4 hectares of extraordinary gardens), live exquisite gastronomic experiences in our gourmet restaurant and sensations of well-being in our exclusive Spa. Welcome to Baños de Agua Santa and Samari Spa Resort, jewel of Ecuador! Travelers' Choice ™ 2017 by TripAdvisor!